The Glow activates conventional fans, air conditioners, and other appliances in response to changes in your home's air quality. Environmental monitoring is no longer a particularly novel smart-home trick. The ability to track indoor “vitals” like temperature, humidity, and air quality drives several standalone devices and is increasingly built into home security cameras like the LG Smart Security Wireless Camera. The problem is that while most of these monitors can accurately tell you when your indoor air is getting uncomfortable or even toxic, they can’t do anything to remedy it. That’s what makes the Awair Glow unique. It not only can respond when it detects changes in your indoor air quality, it does so by activating the conventional fans, heaters, and other appliances you already have in your home. 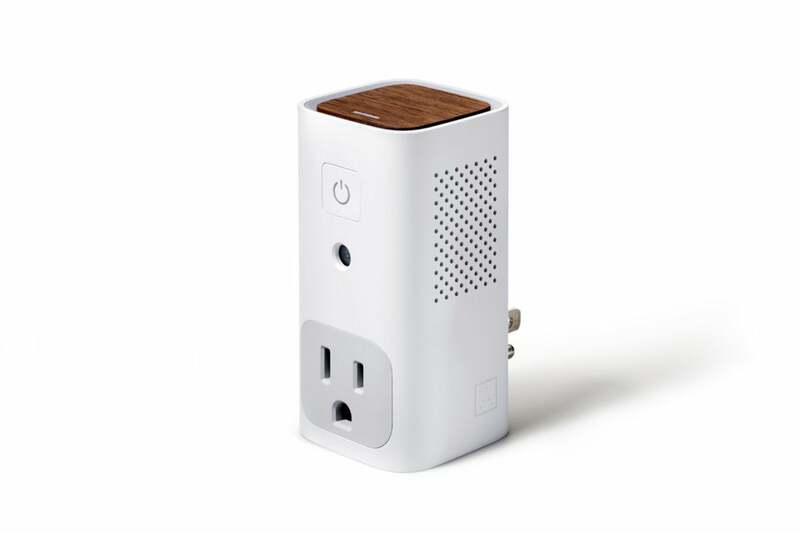 The Awair Glow is about the same size as an air freshener plug-in, and like one of those, it inserts directly into any AC outlet. The matte-white plastic body is topped by a touch-sensitive wood-grain pad. A translucent strip frames this button and operates as a night light. Embedded in the bottom of the button is another translucent light that glows different colors to indicate the room’s current air quality. The Glow also has a built-in motion-activated night light. 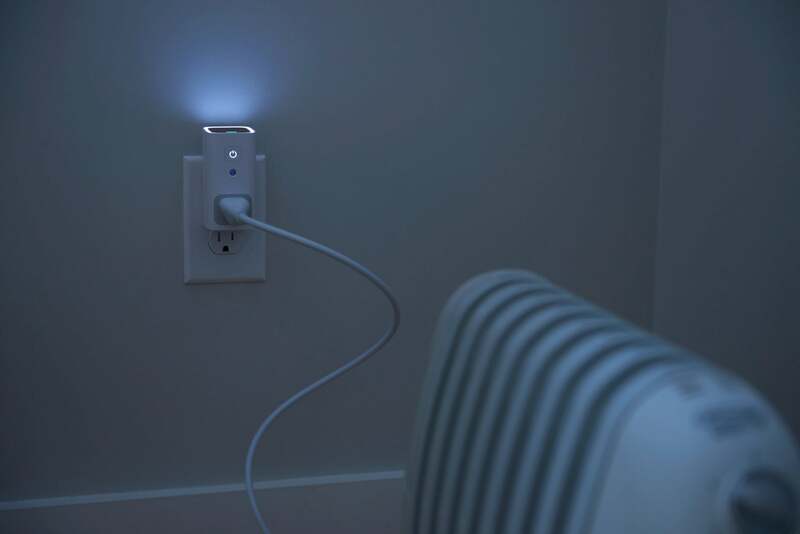 A three-prong AC outlet is built into the front of the Glow, so you can plug in “dumb” appliances like fans, air purifiers, and dehumidifiers, and have the Glow trigger them to respond to air conditions. A small motion sensor is inset above the outlet and will activate the nightlight when movement is detected. 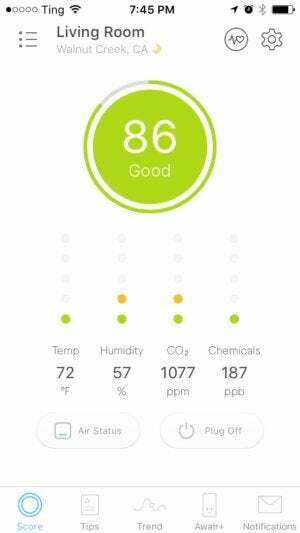 Although you can monitor air quality via the indicator light alone, for in-depth metrics and the ability to smarten those ordinary appliances, you’ll need to download the Awair companion app. The app walks your through the painless process of connecting the Glow to your Wi-Fi and taking a tour of the device’s features. The Awair app gives you an air quality score and breaks down the temperature, humidity, and CO2 and "chemicals" levels. The app gives you an overall air quality score of Poor, Fair, or Good. The indicator light on the top of Glow will color to correspond with this score: red for poor, yellow for fair, and green for good. Beneath this is a breakdown of the elements—temperature, humidity, CO2, and “chemicals”— that factor into your score. They’re pretty accurate, too. The first two always jibed with my indooor thermometer and hygrometer. You can elect to be pushed notifications based on changes to any or all of these factors. On top of real-time monitoring, the Awair app includes a “tips” tab that provides recommendations and articles for improving your environment based on the current readings, for example, replacing incandescent light bulbs with fluorescent or LED bulbs to reduce CO2 emissions. You can also track your air quality scores and changes in individual elements over time as charted on a graph. Of course, the Glow's real hook is its ability to automate non-smart appliances. I hooked it up to a Honeywell air purifier I’ve had for years. 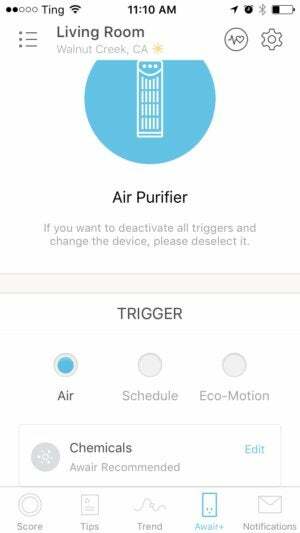 When you select the type of device you’ve plugged in from the app, it defaults to a recommended trigger but you can tell it to activate based on various air quality factors, a schedule, or movement in the room. I went with the recommendation, which activated the purifier when the chemicals level hit 345 ppb. You can add chose triggers to activate your plugged-in "dumb" appliances. When I first plugged in the air purifier, my air quality was rated a “fair” 78, and the device turned on immediately. It ran for about 20 minutes until my score rose to a “good” 81 and then it shut off. I also used the Glow with a dehumidifier in a room where we need to manage the humidity and it automatically kept levels to my desired 45 to 50 percent. Once you’ve connected an appliance to Glow you can also use Google Home or Alexa to activate it. I used it with an Echo Dot and commands like “turn on the living room air purifier” and it worked brilliantly. For such a small, unassuming device, the Awair Glow is pretty powerful. Because it has ability to activate the dumb appliances you already have around the house, it has utility for just about everyone, even if you have no intention of diving any deeper into the smart home scene. Try one out and don’t be surprised if you end up buying one for every room in your home. The outstanding Awair Glow is a great way to clean up your indoor air quality and "smarten" your home without a huge investment.